We test the latest SDHC, SDXC, UHS-I and UHS-II memory cards to find out which are the quickest. If you're looking for the fastest and most reliable SD memory card, then look no further, as we've tested all of the latest high speed UHS-I and UHS-II memory cards. Find out how these cards perform in our speed tests. Here's what 624GBs of storage looks like spread over 12 memory cards. Some of the cards have aged better than others, with some looking surprisingly aged despite being relatively new. We tested the fastest UHS-I and UHS-II cards available to us. To make the most of the high speed available with UHS-II cards, you'll need a camera compatible with UHS-II cards, as well as a memory card reader that supports UHS-II. UHS-II cards can be used in UHS-I cameras and card readers, but you won't get the benefit of the additional speed. On the left, below, you can see the extra contacts on the UHS-II card. Here is a list of all the cards we have tested, sorted with the quickest write speeds at the top. We used a USB3 UHS-II card reader for testing. We tested the read and write speeds using Crystal Mark x64, with 50MB sizes, as these are closest to photo file sizes, and ran each test three times. In photography, write speeds are the most important as this is the speed at which a device, such as a digital camera, can write photos to the memory card. If write speeds are slow, then it may slow down your shot-to-shot time or the amount of photos you can continuously write to the card. The read speed is important for when you want to view the photos or copy them onto a computer or other device. An important factor to consider is warranty and reliability. Ideally, you would want the most reliable card possible so that your photos are never lost however, if the card does fail, then a long warranty will mean that the manufacturer should replace or repair your card. Although, recovery of images is unlikely when a card physically fails, recovery software can help recover accidentally deleted files, and some of these cards come with free recovery software. Reliability can't be determined on new cards, as it could take a long time for the card to fail, if it ever does. One thing to consider is how durable the card is and if you look at Samsung cards, for example, they are waterproof, shockproof, magnetic proof and come with a 10-year warranty so should survive much more mistreatment than others, as we found out in our test of one of their microSD cards. Looking for a MicroSD card? Have a look at the Top 10 Best MicroSD Cards. If you're looking for a Compact Flash card, have a look at the Top 10 Best Compact Flash memory cards. 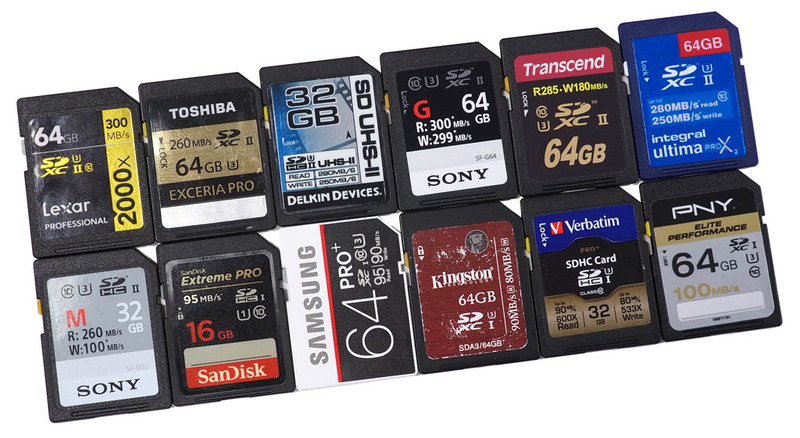 Find out more about memory cards, in our complete guide to memory cards. * We've included XD and Sony Memory Stick memory just as a reference point, tested on a USB2 card reader, and you can see why it was a good idea for manufacturers to move away from using XD. Be careful with Lexar cards if you are a Nikon shooter. They may give problems when used with the Nikon D500 (reported by Dpreview and others). Personally I had problems on Nikon D700 and D810 with Lexar CF cards which would occasionally destroy my images. In comparison I never had problems with Sandisk. I have the 1000x Lexar card and it slows down to a crawl when less than half full in a Canon 7D Mark II. None of my CF cards slow down at all and some 600x are faster than the Lexar. It would be good to have a comparison between the 2 formats. Having tried an array of high speed cards in cameras shooting stills, the main advantage of a high speed card seems to be in shooting a high speed sequence, when the camera slows down after the buffer is filled. My Panasonic GX8 will shoot a sequence of about 40 RAW 20Mp frames or 100-120 full size JPGs before slowing down. I'd rarely shoot such a long sequence but I found that cards above the 85 or 90 MBs made no noticeable difference. It's one thing writing to a card with a powerful desktop computer but quite another with the chip in a camera. Panasonic recommend a 100 Mbps card for the quite resource hungry 4K video - note Mb not MB. That is only 12.5 MB throughput, of course. Having tried an array of high speed cards in cameras shooting stills, the main advantage of a high speed card seems to be in shooting a high speed sequence, when the camera slows down after the buffer is filled. My Panasonic GX8 will shoot a sequence of about 40 RAW 20Mp frames or 100-120 full size JPGs before slowing down. I'd rarely shoot such a long sequence but I found that cards above the 85 or 90 MBs made no noticeable difference. It's one thing writing to a card with a powerful desktop computer but quite another with the chip in a camera. Panasonic recommend a 100 Mbps card for the quite resource hungry 4K video - note Mb not MB. That is only 12.5 MB throughput, of course. 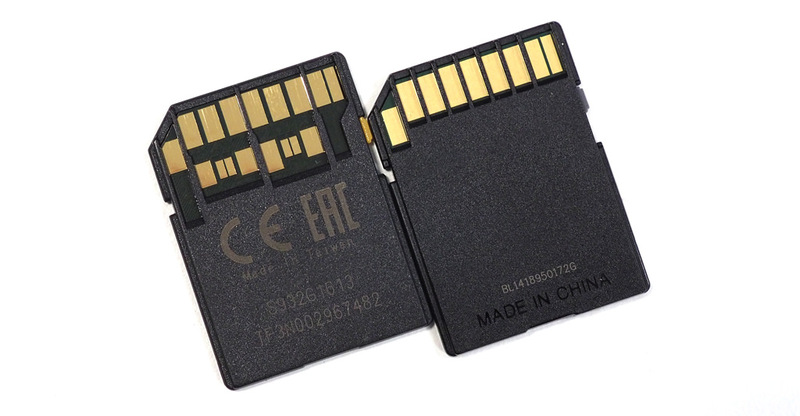 Personally I prefer to have a collection of smaller cards (2Gb - 8Gb). I quite often use a 2GB unless shooting in RAW. The advantage is that if it fails (i.e. on holiday) chances are you have not lost all your pics. I always backup the images on my tablet at first opportunity when out and move them straight away when I get to my PC. In the good ole days you only had 24 or 36 exposures so you ended up have loads of films. Personally I prefer to have a collection of smaller cards (2Gb - 8Gb). I quite often use a 2GB unless shooting in RAW. The advantage is that if it fails (i.e. on holiday) chances are you have not lost all your pics. I always backup the images on my tablet at first opportunity when out and move them straight away when I get to my PC. In the good ole days you only had 24 or 36 exposures so you ended up have loads of films. I've had good luck with my Lexar cards and have found that they consistently give faster write speeds than many competitors, but I'd hesitate recommending them given that Micron (the parent company) is [link=https://www.dpreview.com/news/3111535898/lexar-discontinued-micron-announces-the-end-of-lexar-memory-cards]discontinuing the brand in its entirety[/link] - both SD and CF cards. Definitely a shame, but what can you do? I've had good luck with my Lexar cards and have found that they consistently give faster write speeds than many competitors, but I'd hesitate recommending them given that Micron (the parent company) is discontinuing the brand in its entirety - both SD and CF cards. Definitely a shame, but what can you do? The article is quite misleading as the links don't all take you to the card listed. I tried three an all were incorrect. Come on EPZ you can do better. The article is quite misleading as the links don't all take you to the card listed. I tried three an all were incorrect. Come on EPZ you can do better. After checking i found another that is also wrong. As this is not down as an advertising feature the editorial staff need to do some better checking and don't put links that don't take you to the correct card or to a card of the capacity shown. Hi Alan, I've checked the links, and found the Sony G link was wrong, but the others appear to be working, can you let me know more details in a report?